Leslie and I? We're talking TAMARINDOS today. Tamarinds (or tamarindo en español) are legumes that grow on trees that can get to be as tall as 80 feet high. 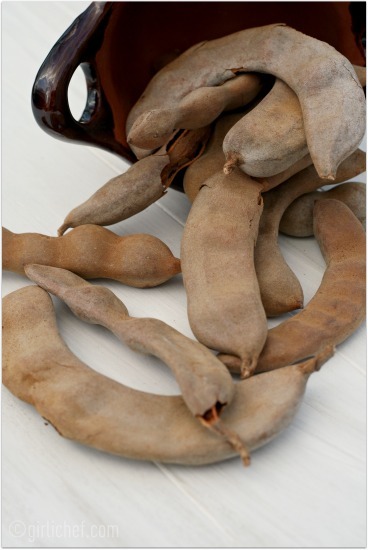 Each tamarind pod contains a soft pulp that surrounds hard seeds. The pulp is edible and acidic and ranges from sour to sweet. It grows in warm, tropical climates and is used to make refreshing beverages, candies and ices, and even used as a savory ingredient in pickled dishes, meat or fish dishes, or condiments like Worcestershire sauce. Fun tamarind fact: Superstition has it that it is dangerous to sleep under a tamarind tree or to tie a pet to one since few plants are able to grow beneath one! 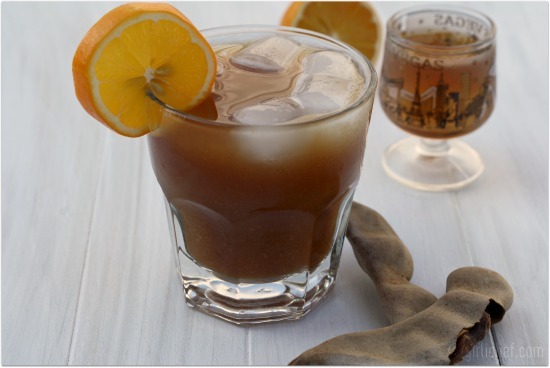 We most commonly use tamarindo fruit to make an agua fresca ("fresh water") which is cool, tangy, sweet, and refreshing. From here you can use the agua to make popsicles or sorbet or even cocktails. We also use it in our Ponche Navideño. And personally, I love tamarindo suckers or candies that are rolled in sugar and chile. Today I've made a Tamarind Brandy Sour which is both delicious and probably way too easy to drink. 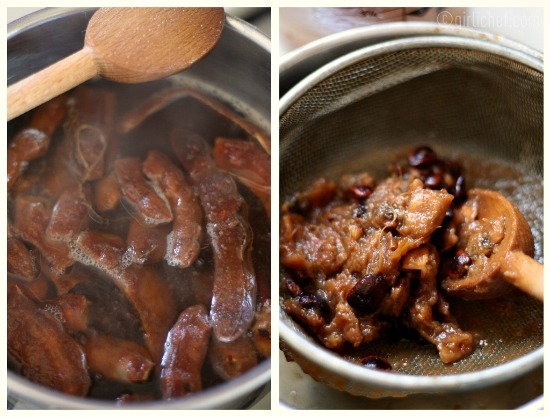 Do you have a favorite use for tamarind pods or leaves? I'd love to hear them and feel free to leave a link to any recipes using tamarinds in the comments. 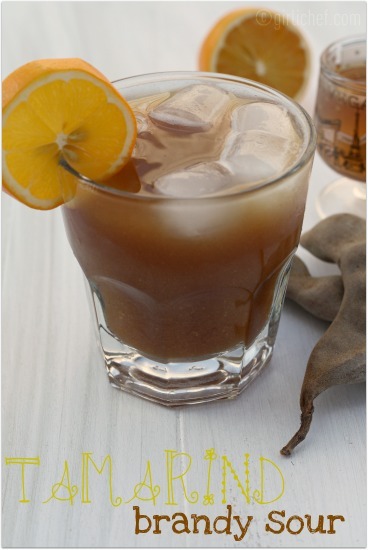 And if you have a moment, why not head over to visit my friend Leslie at her kitchen, La Cocina de Leslie and check out her version of Agua de Tamarindo!? 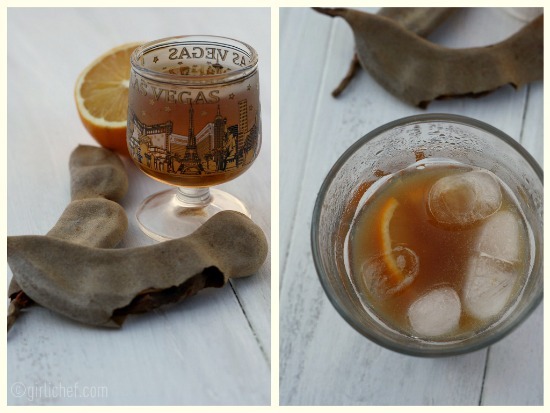 How to make homemade aqua de tamarindo and use it to make Tamarind Brandy Sour cocktails. Remove the stems, strings, and shell from around the tamarinds. Place the sticky fruit (seeds and all) into a medium pot with the piloncillo and water. Bring to a boil. Let simmer for a few minutes, then turn off the heat. Pour into a glass jar or bowl and let sit for about 2 hours. Using clean hands, break up and knead the softened pods to release the seeds from the pulp. Strain through a sieve, pressing on the seeds and fibers to get as much of the tamarind goodness through as you can. Taste and adjust sweetness, if necessary. Refrigerate until ready to use. Shake or stir before serving. Add agua de tamarindo, brandy, and the Meyer lemon juice to a cocktail shaker with some ice. Shake it up and strain over ice into two short glasses. Garnish with a round of Meyer lemon, if you wish. Enjoy!